A Miami-Dade County mosquito control worker sprays around a school in the Wynwood area of Miami earlier this month. 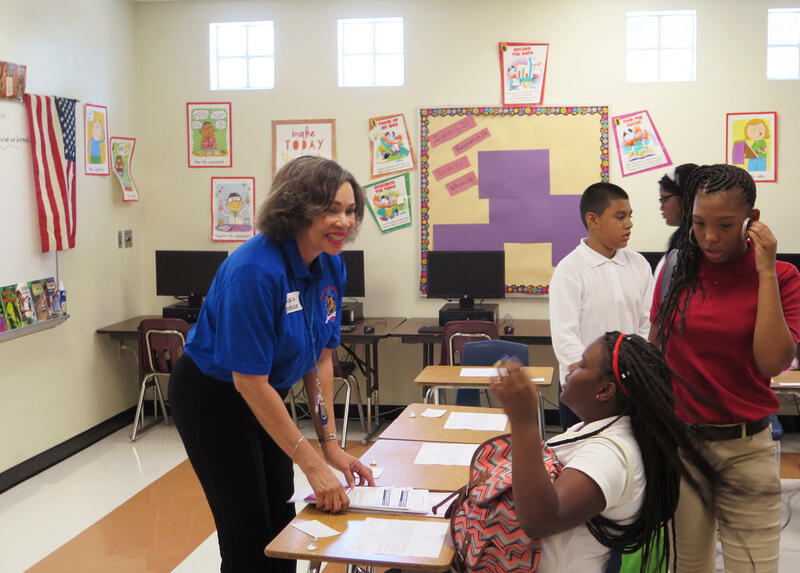 Jose De Diego Middle School teacher Cyd Browne challenged her 7th-grade engineering class to design a plan to protect an area from the mosquitoes that carry Zika. Over the weekend, school officials distributed cans of mosquito repellent to parents and made long-sleeved shirts and pants available to students. For the past month, the county has conducted intensive spraying and outreach. While health officials are optimistic about their efforts to control mosquitoes in this neighborhood, on Friday they said that Zika has now spread to another neighborhood several miles away, on Miami Beach. The start of the school year is always hectic. The principal of Jose de Diego Middle School, April Thompson-Williams, says Zika leaves parents with even more questions. "They just want to know how to protect their children and to ensure that they're safe when they come to school," she says. Kenyanna Darden brought her daughter, Jaynela, to school today. She says the school district seems to have a good plan in place to protect students. "They sent text messages, emails, voicemail, all that, all day, every day," she says. The message? "Protect yourself, wear 'Off' spray." Another parent, Nicole Pugh, still has some worries after dropping her daughter off at school. "Yeah, I worry about it," she says. "But I made sure she was sprayed and everything. So hopefully, they'll take care of the situation." Superintendent Alberto Carvalho was visiting schools in both of Miami's Zika transmission zones today, spreading the message that students should wear repellent, long-sleeved shirts, long pants — and that they should be in school. "Every single school is air-conditioned. Every single bus is air-conditioned," he says. "There is no contact with areas that have standing water. And kids are well-protected in air-conditioned areas. They're going to be fine." Carvalho says recess and sports will go on as usual. Cyd Browne began her 7th-grade engineering class today with a challenge. She asked her students to design a plan to protect an area from mosquitoes that carry Zika. "We're going to look to see the science behind this, do our research and then come up with a solution to make sure everyone knows to spill the water wherever there's standing water and to drain and cover," she says. Every teacher at Jose de Diego Middle school started today with a Zika information session. For children and anyone who's not pregnant, the symptoms associated with Zika are usually mild. Most people don't even know they've had the disease. But the chief of Emergency Medicine at Miami's Jackson Memorial Hospital, Bobby Kapur, says that from a public health standpoint it's crucial that students be protected. "We have hundreds, maybe thousands of students clustered in one area," he says, adding that any student infected through a mosquito bite could bring that infection back into their homes and communities. Controlling the spread of Zika is a major challenge. Along with the two zones already identified, health officials say they're investigating possible cases of Zika transmission in several other areas in South Florida. Students returned to school today in Miami, and this year, there's a new concern - the threat of Zika. Nine schools in Miami-Dade County are in or near a zone where health officials have confirmed mosquitoes have been spreading the Zika virus. NPR's Greg Allen reports on the measures the school district is taking to protect students and to reassure parents. GREG ALLEN, BYLINE: Jose de Diego Middle School is in Miami's Wynwood neighborhood, an area known for its restaurants, cafes and street art. But it's also home to middle-class and low-income families, many newly arrived from places like Venezuela, Cuba and Haiti. ALBERTO CARVALHO: Morning, Buddy - big handshake here - everything all right? ALLEN: Miami-Dade school district superintendent Alberto Carvalho was roaming the hallway today to check on how well the school is prepared for Zika. Over the weekend, school officials distributed cans of mosquito repellent to parents and made long-sleeved shirts and long pants available to students who need them. Nearly a month ago, health officials confirmed that mosquitoes were spreading Zika in this neighborhood. Since then, the county has conducted intensive spraying and outreach. 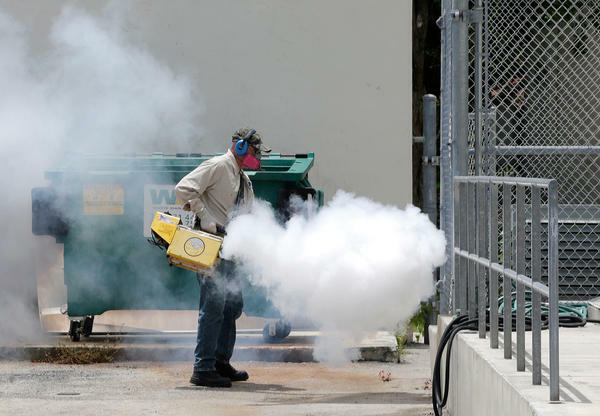 While health officials are optimistic about their efforts to control mosquitoes in this neighborhood, on Friday, they confirmed that Zika has now spread to another area several miles away on Miami Beach. The start of the school year is always hectic. The principal of Jose de Diego Middle School, April Thompson-Williams, says Zika leaves parents with even more questions. APRIL THOMPSON-WILLIAMS: They just want to know how to protect their children and ensure that they're safe when they come to school. ALLEN: Kenyanna Darden brought her daughter Jaynela to school today. She said the school district seems to have a good plan in place to protect students. KENYANNA DARDEN: They sent text messages, emails, voice mail, all that, all day, every day. ALLEN: And what did they tell you? What kind of stuff? DARDEN: Protect yourself with Off! spray before you come. ALLEN: Another parent, Nicole Pugh, still has some worries. NICOLE PUGH: Yeah, I worry about it, but I made sure she was sprayed and everything. But hopefully they'll take care of the situation. ALLEN: Superintendent Alberto Carvalho was visiting schools in both of Miami's local Zika transmission zones today, spreading the message that students should wear repellent, long-sleeved shirts, long pants and that they should be in school. CARVALHO: Every single school is air conditioned. Every single bus is air conditioned. There is no contact with areas that have, you know, standing water, and kids are well-protected in air conditioned areas. They're going to be fine. ALLEN: Carvalho says recess and sports will go on as usual. Cyd Browne began her seventh grade engineering class today with a challenge. ALLEN: Browne's assignment for the class was to design a plan to protect an area from the mosquitoes that carry Zika. BROWNE: So we're going to look to see the science behind of this, do our research and then come up with a solution to take back into the neighborhood to make sure that everyone knows to spill the water wherever there's standing water and to drain and cover. And I want you to tell me what you know about the Zika virus, OK - what you know. ALLEN: About a dozen students break into groups and begin problem solving. Every teacher at Jose de Diego Middle School started today with a Zika information session. For children and anyone who's not pregnant, the symptoms associated with Zika are usually mild, and most people don't even know they've had the disease. But the chief of emergency medicine at Miami's Jackson Memorial Hospital, Bobby Kapur, says from a public health standpoint, it's crucial that students be protected from the disease. BOBBY KAPUR: We have hundreds, maybe thousands of students clustered in one area, and they're - may get infected with a mosquito bite and bring those - bring that infection back into their local homes or local communities on their street. ALLEN: Controlling the spread of Zika is a major challenge. Along with the two zones already identified, health officials say they're investigating possible cases of local Zika transmission in several other areas in south Florida. Greg Allen, NPR News, Miami. Transcript provided by NPR, Copyright NPR.